Barcelona, 29th of September 2017 – In 2016, more than 224 million passengers travelled by plane in India. By 2020, India is expected to be the world’s third largest aviation market, with a fleet of more than 800 aircraft. ADELTE is part of the modernization at 12 of the country’s most important airports, installing state-of-the-art passenger boarding bridges. India’s continued economic development and growth demands an efficient domestic transport system linked to international access. In the period 2016-2020, an investment of USD 15 trillion is earmarked for the improvement and development of airport infrastructures. ADELTE is playing a key role in this ambitious modernization project, designing, manufacturing and installing, as a start, 24 apron drive passenger boarding bridges. These are electromechanical units with glass tunnels, and come equipped with the latest VDGS (Visual Docking Guidance Systems). 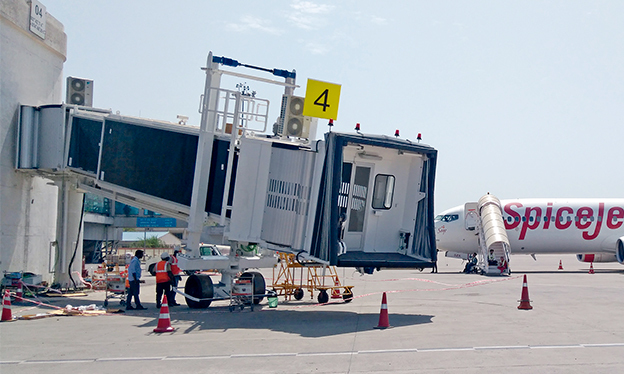 These advanced boarding bridges enable rapid boarding and disembarking and will significantly improve the safety and comfort of the passenger experience at Ahmedabad, Amritsar, Calicut, Coimbatore, Goa, Guwahati, Jammu, Lucknow, Mangalore, Trichy, Trivandrum and Vadodara airports. The first 3 apron drive boarding bridges of the project are being installed at Goa Airport and should be inaugurated this fall. “The Airport Authority of India (AAI) has commissioned ADELTE, relying on both our cutting-edge technology and our expertise in managing complex projects. This is the beginning of a long-term relationship, working together as part of the Make in India initiative” says Raimon Albiol, Managing Director of ADELTE. The government’s “Make in India” initiative encourages both international and domestic companies to manufacture their products in India. To this end, ADELTE has partnered with local companies to manufacture mainly telescopic tunnels, to ADELTE’s usual high level of quality and production standards. The complexity of this project, with airports spread all over India, needed a company capable of handling the logistical difficulties associated with multi-site projects. ADELTE, with its proven experience in logistics and transport, was the logical choice. “We are very proud to work with the AAI on this airport infrastructure development project and to contribute to the modernization of boarding operations throughout the country and the whole region as we are already working on similar projects in Iraq, Iran and Pakistan“ adds Raimon Albiol.